My brother loves classic Disney movies. He knows and loves them all backward and forward. I always hated them growing up, because I thought those princesses needed to grow a backbone. This was a cause of constant sibling disagreement in my household. I grew up and read some great feminist critiques of Disney. They also came out with movies like Mulan that have much better gender politics. But I still feel the need to go back and rewrite those classic Disney movies, because those cartoon women deserve better. 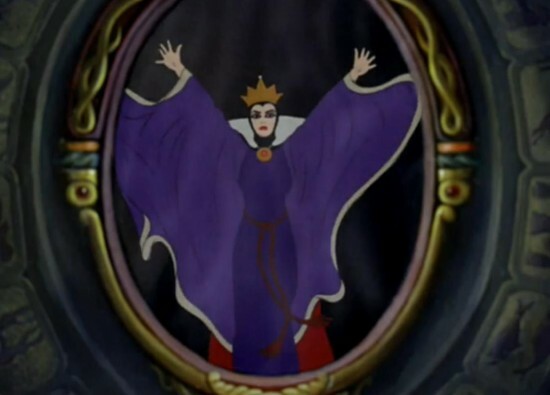 It’s not her fault the mirror judges her by sexist, ageist beauty standards. When the seven dwarfs see what the Queen has done to Snow White and why, they lock her inside the cottage and give her a long talk about patriarchal beauty standards. That mirror was probably made by a human man, they explain, because beauty is subjective, and dwarfs don’t have gendered beauty standards at all. “Not all of us identify as men, you know,” Doc explains. “Though humans usually don’t understand that.” The Queen tearfully admits that she’s cracking under the pressure of the crushingly high beauty standards her kingdom has for its queens, which isn’t fair because her father the king had never taken a bath in his life and no one ever said he was too ugly, and agrees to lift the spell on Snow White if the dwarfs will adopt her into their society. Snow White becomes Queen and takes on Doc as her advisor, and the former Queen lives in the masculine dwarf fashion that she always secretly wanted and goes into business as a freelance magician.